mundane jane: What you might hear if not for the frogs in the waterfall at lakeside during a thunderstorm CD. What you might hear if not for the frogs in the waterfall at lakeside during a thunderstorm CD. Thursday was a very good day. And because it was, I had occasion to wonder--what does the massage therapist think about while she's rubbing, kneading, and palpating her way through my $60.00 hour? Hopefully, she's not thinking, "Okay. Focus. You know this. The distal scapula feticulitus controls the, ummm, the masculica-something." Then again, it's probably not a good thing if she is so thoroughly on auto-pilot that she's putting together her grocery list, or the final aria of that opera she's composing for grad school. And I really hope--no, I pray--that she's not thinking, "Jeez, doesn't this lady ever walk anywhere? Ever?" But even that--as bad as it is--is preferable to "Oops! Is that supposed to bend that way?" I started to ask her at one point, just what sorts of things did go through her mind as she worked. But after a while, I sort of got lost in my own thoughts. First "Ohhh." Then "Ahhhh." And finally, "Zzzzz." 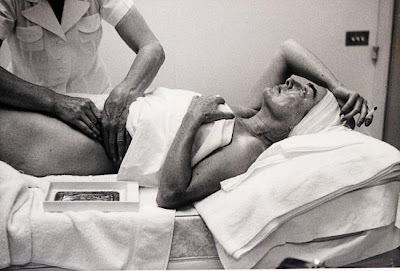 photo, Joan Crawford Massage, photographer unknown, via Tangerines in a Red Net Bag.